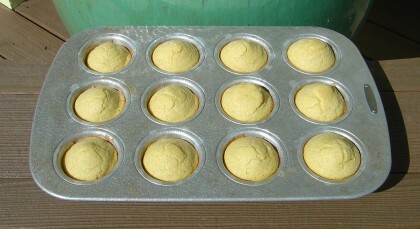 Corn muffins/bread were the first thing I ever learned to bake all by myself, using the recipe on the Quaker Yellow Corn Meal cylinder back when I was still in the single digits and had to stand on a chair to get it down from the shelf. These days I use bulk-bin whole-grain cornmeal rather than the Quaker degerminated, and a recipe with more cornmeal than flour instead of the other way around, but corn muffins are still one of the most fast and basic things for me to make — among other things good for breakfast, an afternoon snack, or dinner with chili or soup. Here’s the recipe, and then down below it I’ll talk about some variations (such as Wednesday’s additions of curry powder and corn kernels). Cut the butter into three pieces, put the three pieces into the three muffin cups at one end of your muffin pan, and put the muffin pan into the oven to melt the butter while the oven pre-heats. Put the cornmeal, flour, sugar, baking powder, and salt into a mixer/mixing bowl, and briefly mix or stir. Bake for about 19 minutes, until done — the muffins should be just barely starting to brown, and a knife stuck into one should come out clean. Makes 1 dozen muffins. As usual I’ll claim that the time to eat these is hot out of the oven, but if you have any muffins left over, they’re also good toasted — I cut them in half like bagels, toast them in the toaster oven, spread a little butter on and then reassemble. With the batch I made on Wednesday (shown in the photo above), while I was getting out the ingredients I was thinking about how a certain kind of naan made with curry powder smelled so good, and decided to try adding ½ teaspoon of Penzey’s Sweet Curry Powder to the dry ingredients. And as long as I was adding things, and there was a bag of corn kernels in the freezer, I decided to add ¼ cup of those as well (thawing them first, and then stirring them into the batter after having mixed in all the other ingredients). I had deliberately used small amounts of both the curry powder and the corn kernels — if they turned out to be a good combination I could always up the amounts next time, but if not they wouldn’t be totally overpowering — and the results were kind of subtle. My son Sam gave a thumb’s up to the curry powder, that it made for less of a bland corn-muffins flavor, but personally it didn’t really grab me despite my being a big curry fan. As for the corn kernels, they were kind of interesting immediately after the muffins came out of the oven — occasionally running into a steamy corn kernel — but once the muffins cooled they became basically indistinguishable from the general muffin-ness. I sometimes run across corn muffins/bread with bell pepper bits, but when I did it I picked one each of tiny green, red, and yellow hot peppers from the greenhouse, and minced them so finely that they were almost like the sprinkles used to make “confetti cupcakes”. The muffins had a nice little bit of kick to them, but not so intense as to burn a hole in your tongue, plus were pretty on the inside. One of these days I should try roasting and finely-chopping an Anaheim pepper or other not-overly-hot pepper for corn muffins — I think the flavor/texture might work better than raw bell pepper. One time I was running a little short on cornmeal, and made up the difference with (dry, uncooked) polenta. This is one of those “I should try that again” things, because I don’t really remember how much polenta I used — maybe ¼ cup? Anyway, if you like your corn muffin/bread to have a little “grit” to it, then substituting a bit of the more coarsely-ground polenta will dial that up a bit. As a child, cornbread was my thing — the 9″ square pan was less fussy than a muffin pan, and the center piece was my prize (I can’t relate to “edge pans ” — for me the tallest, softest slice is the best). But as a parent, twelve servings of finger food beat out nine crumbly slices needing plates and silverware, and so I pretty much stopped making cornbread in favor of muffins. I’ve got super corn muffin power. I use much more cornmeal than flour. Have it all baked up, natch! Before you are out of the shower.